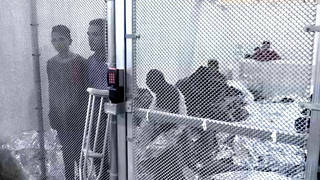 Dems Accuse Trump Admin of “State-Sponsored Child Abuse” as Separated Migrant Children Scandal Grows | Democracy Now! Trump administration officials are acknowledging that there may be thousands more missing immigrant children who were separated from their parents than originally reported. This was the focus of a hearing on Thursday of the House Energy and Commerce Subcommittee on Oversight and Investigations. We speak to Lee Gelernt, deputy director of the ACLU Immigrants’ Rights Project. He is the lead lawyer on the ACLU’s national challenge to the Trump administration’s family separation practice. He testified at the hearing yesterday. Democracy Now! has a job opening: full-time, 1-year paid news production fellowship. Check out democracynow.org. I’m Amy Goodman. Thanks so much for joining us.